Glass has many properties that make it useful for scientific applications, such as good chemical resistance and being transparent and good for heat transfer. But despite the important role glass plays in science, the skill to develop the glassware is in decline. 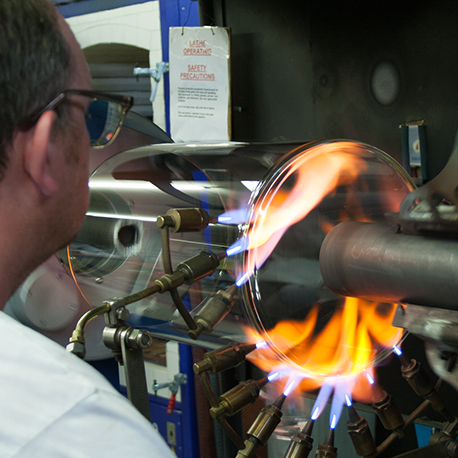 Scientific glassblowing has now been classed as an endangered craft by The Radcliffe Trust. He has been glassblowing for 40 years but his interest in the profession goes even further back. He said: “It was a demonstration with the scouts that kind of stuck with me. Talking about the craft, Paul said: “It has been in decline because things have changed. The demand for glassware has declined due to alternative materials being available and new chemistry techniques being used. Craig Joyce is the first apprentice to join the training programme at Radleys, which takes about three to five years. He fell into the job by chance when he was looking for a change after years spent mostly working in customer services at bars and restaurants. The position caught his eye when he was job hunting. He said: “It looked really interesting. “I’ve always liked making things and I like doing DIY at home. Now he is several months into the apprenticeship and is enjoying using his new skill. He said: “I think it's amazing what you can do with glass and I really can’t speak highly enough of my mentor. “It can be very frustrating if you don’t do something right. You can burn yourself, or the item you’re working on can easily crack, or break. As well as working on orders from their glassware catalogue, Radleys also deals with bespoke requests from scientists who need a specific piece of glass to help them solve a problem. You also need to get your head around more technical aspects like engineering tolerances. Scientific glassblowing doesn’t leave much room for error. If you are not precise, you could end up producing a piece of equipment that isn’t fit for purpose, or is unsafe to use. Trainees start of by mastering basic techniques, like joining two pieces of glass, which in itself can take a while. A lot of the process involves benchwork, which’s done by hand with a flame. This gives them a hands on feel for how glass reacts. For example, when it’s molten hot, it follows gravity. They then learn how to put all that they’ve learnt together. Everything they make needs to go into an oven to be annealed at 570℃. A lot of Radleys glasswork involves making reaction vessels for pharmaceutical or polymer companies. Paul’s work as Workshop Foreman also includes dealing with health and safety, technical issues and quality assurance. He leads a team of eight glassblowers. During his time as a foreman, he has noticed it has become difficult to find trainees. Paul estimates there are fewer than 300 glassblowers in the UK. The British Society of Scientific Glassblowers is one of the places the small community can turn to for support.